Finalists for PA Consulting Group’s annual Raspberry Pi programming competition have been selected. 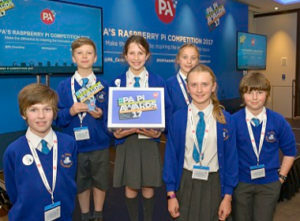 The nine teams of school children will present their inventions to nine expert judges on Tuesday, 17 April at the IET in London. a water meter which measures how many litres of water you use in the shower. After your shower, a message is sent to your device stating how much water has been used and the impact that this has had on the environment.